Twitch: It is a strange place. Alongside hosting some of the world's most popular gaming channels on the planet, such as the Overwatch League and Ninja's Fortnite: Battle Royale sessions, the service brings out some of the best in the gaming community, letting popular streamers and their fans interact on the fly. Hearthstone cards are revealed by major streamers. Speedrunners break records and set the benchmark for future players. Livestreams fall apart and become campfire stories for viewers. Or something incredible happens during an esports match, like Philadelphia Fusion's major upset against New York Excelsior. Chances are if you're a Twitch regular, you'll want to hold onto one of these Kodak moments with a clip, or a short segment from a livestream that lives independently from the full streamer's video. Twitch doesn't natively let you download clips (for now), but if you're interested in holding onto a few, here's how to do it. Arguably the fastest way to save clips, this technique works for both Firefox and Chrome users, according to streamer sprEEEzy. That means Twitch viewers watching clips on their Chromebook can also use this method to download clips onto their hard drive and watch them on the go, since Chromebook is powered by Google's Chrome web browser. Start by finding a clip and locating its URL (if you need one to try out, here's one from Ninja's stream). Right-click on the video and select "Inspect" from the drop-down menu, then hit delete or backspace as soon as the Inspect menu opens. This will remove a specific line of code that controls the Twitch clip's overlay and presentation on your browser's end, unlocking it for download. From there, close out the Inspect menu, right-click on your video again, and click "Save video as." Your web browser will then download the clip in .mp4 format, letting you watch it locally as soon as it's finished saving onto your PC. Let's say you're on a mobile phone or using a web browser aside from Chrome or Firefox. There's an equally simple way to download clips straight from Twitch, and all it requires is an additional website visit to land your highlight. Clipr calls itself the "cleanest, easiest, and most reliable Twitch clip downloader on the net," and we're inclined to believe that. 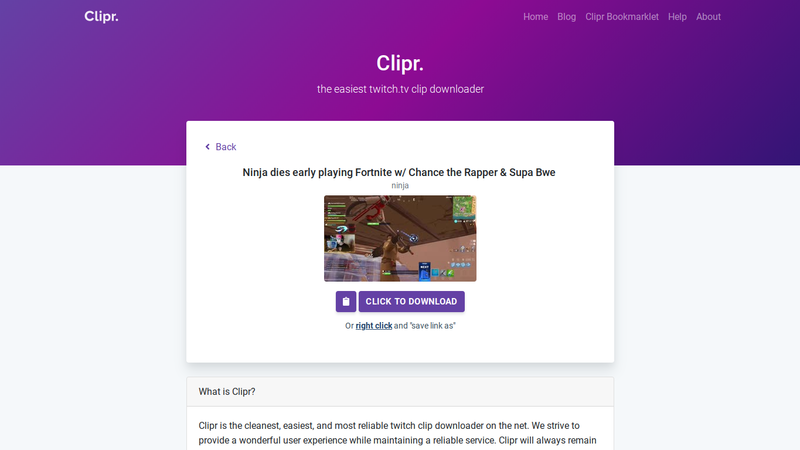 Like other online video rippers, Clipr lets users save Twitch clips by copy and pasting the Twitch video's URL into Clipr's download address bar. In seconds, the website grabs the video's raw .mp4 file and lets users save it, view it directly in their web browser, or even copy the raw URL file for future sharing. Clipr is great because it's simple. All you need is your Twitch clip's URL, and you're set. There's even a bookmarklet that users can use to speed up the process, making Twitch clip downloads extremely quick. For more information visit Clipr's official About page.